An empty oil tanker mysteriously beached on Liberia has left authorities baffled as the government struggles to determine the fate of the crew. 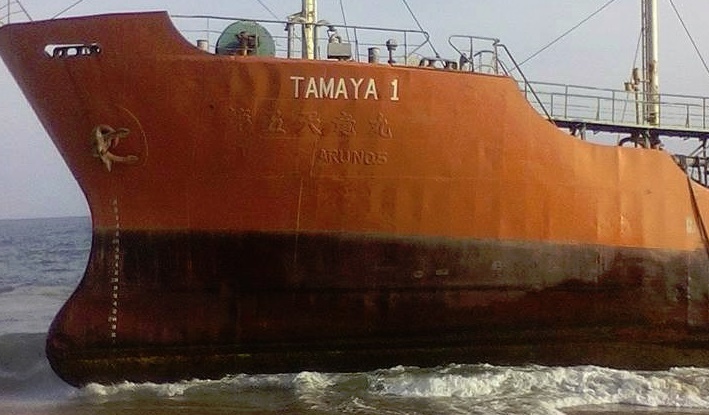 Discovered on May 4 on a beach in Robertsport, in the country’s far north-west, the 63-metre tanker, Tamaya 1, was last seen on Aprill 22 after leaving its registered port in Panama. With the vessel’s last known location far outside pirate waters, authorities are struggling to determine why the crew would have abandoned the ship. The Liberian maritime authority could only speculate as to why the ship was empty, however evidence of a fire in the captain's quarters supported the theory of foul play. "Our best bet is that the vessel’s owner might have gone broke and had no money to pay crew members,” a port authority spokeperson told the Liberian Daily Observer. "Therefore, the crew abandoned the ship." By the time authorities established a perimeter the vessel had been looted and vandalised by locals. Once highly sought by pirates, oil tankers have become less desirable targets due to the lowered costs of crude oil and the heavy naval presence off the African coast. I heard the lifeboats were NOT on the vessel? This would be consistent with an abandoned ship. In addition, the captions quarters had a fire? No. Sailed from usual base, Dakar, southwards on 21/4. Name plates manipulated from "TENRYU MARU No.5" into "ARUNO 5". As per shipwrecklog.com from 4th of May: "The tanker had been last reported off Dakar on April 22 before drifting onto the beach in Liberia on May 4. When authorities boarded the vessel, they found there was no crew on board. Local reports suspect the owner was unable to pay the crew. Thus, the crew decided to abandon the tanker off Dakar. No reports of any pollution released. Liberia authorities have launched an investigation into the incident."